I want to start this post off by saying that I am a little biased when it comes to Barbados. We first visited this beautiful Caribbean island with a baby and toddler in tow. During their daily naps, I would sit on a porch staring at the ocean, plotting my next career move (that I knew had to involve self-employment). Those roughly etched out notes, from those long afternoons, (creatively encouraged by a dose of Bajan rum punch), would eventually become the framework for this site. It has been with great enthusiasm that we have since returned to Barbados several times – crafting and improving upon this guide to Barbados for families. We love the island for its unique character and culture, incredible beaches, caves and gardens, abundance of wildlife and excellent Bajan cuisine. 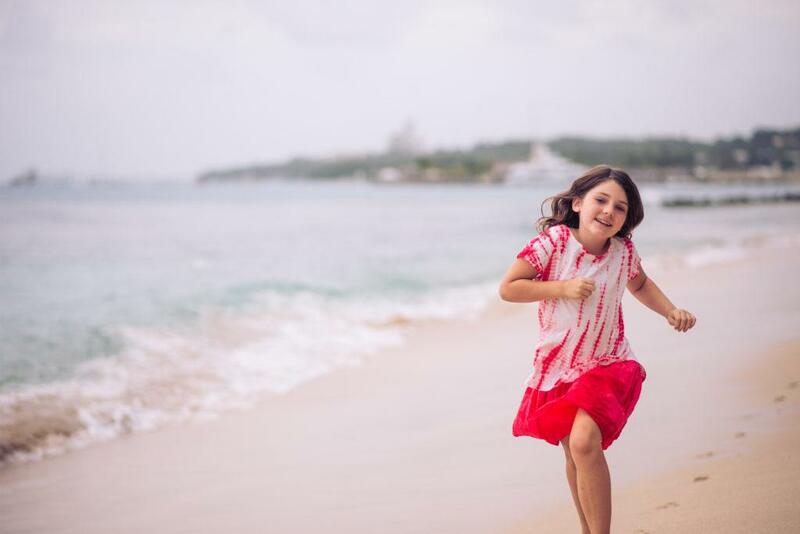 Here is everything we think families traveling to Barbados with a baby, toddler or kids of any age will enjoy, including some essential tips for the island. 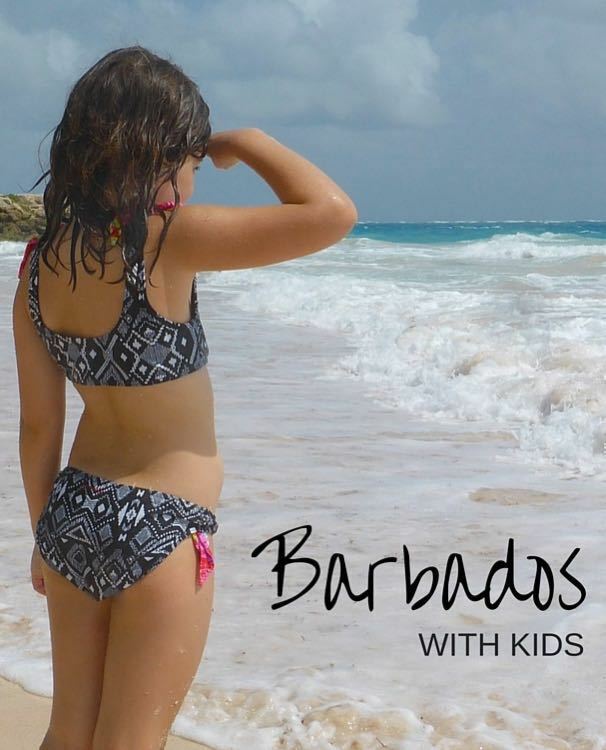 Take a quick peek at this 2 minute youtube video on Barbados with kids or just read on. Need more? Here is a video from an earlier trip (this one has turtles!). Please use the following menu to go straight to what you are looking for. We like this place so much that we sometimes visit twice! 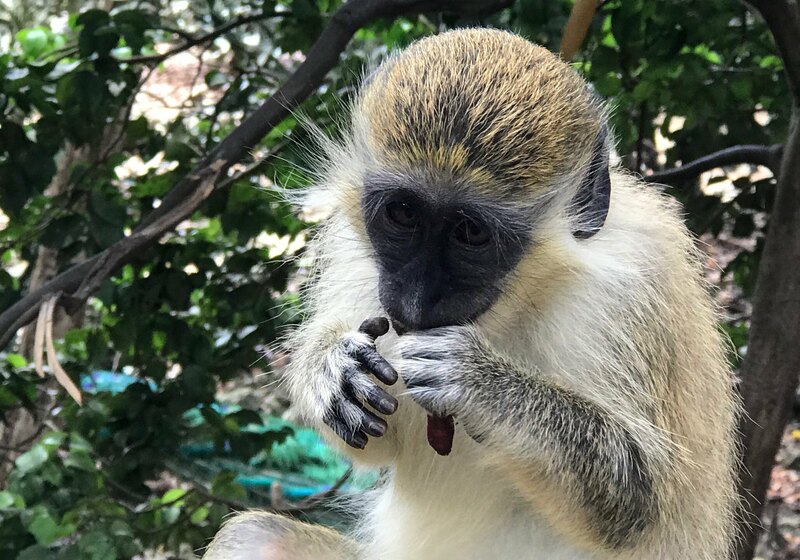 Barbados Wildlife Reserve allows kids to enjoy a close-up encounter with some of the island’s wildlife including green monkeys, iguanas and tortoises. The best time to visit is around the 2pm feeding when the monkeys come down from the treetops. Be sure to take the short little stroll up the path to the Signal Station, for beautiful views of Bathsheba on the east coast. Learn more about the Barbados Wildlife Reserve on the Barbados.org website. There are a variety of ways to see sea turtles while visiting Barbados. We had been told that they tend to hang around out in front of the Lone Star Hotel on Alleynes Bay, so we used the many boats as a cue and just snorkeled out 75 meters from the beach to see them. With little ones, however, you may prefer to book a boat tour. There are some good 1.5 hour glass bottom boat tours that run from Carlisle Bay and Paynes Bay starting at around $30 USD per person (see https://barbados.org). Calypso Cruises also comes highly recommended by locals for their family run catamaran operation, great service and small groups (their boat allows a maximum of 14 people). They receive excellent reviews and the catamaran is not a party boat like some others. They are currently reworking their website, so for the moment, please email owner Nick directly for availability and rates at: calypsocruisesbarbados@gmail.com. Note: We were also able to feed sea turtles off the dock in Oisten’s on the south coast (home to the famous Oisten’s Friday Night Fish Fry), by purchasing scraps from the local fish vendors and tossing them off the end of the dock (see second video above). The most gentle beaches for kids are on the west coast of Barbados – also known as the Platinum Coast. 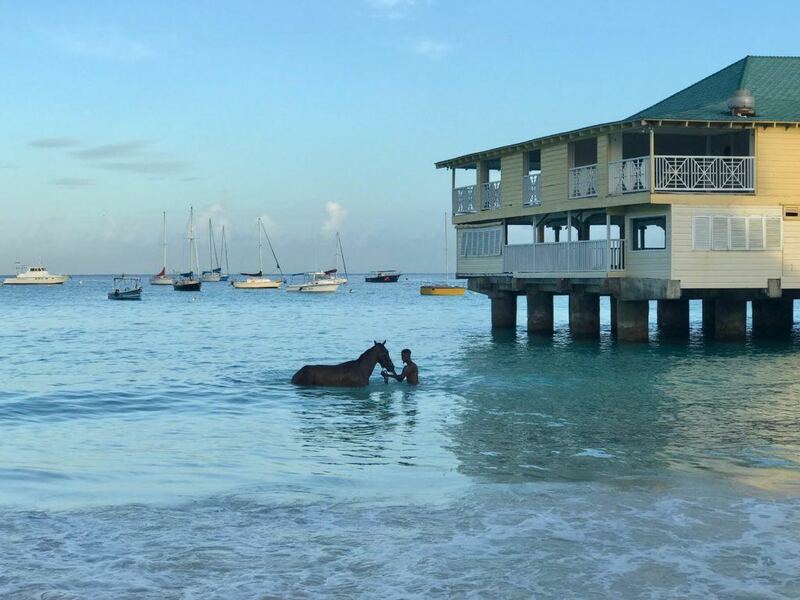 Some of our favourites include Mullins Bay, Alleynes Bay and Paynes Bay. The kids have also enjoyed doing a little snorkeling at the Folkestone Marine Park (just north of Holetown). In addition to pretty fish near the shore, this nicely shaded area has a playground and occasionally, green monkeys playing in the trees. If you are coming in by cruise ship and just want to stay in Bridgetown, Carlisle Bay gets high marks. Harbour Lights offers packages that include a beach chair and umbrella rental plus a turtle tour for $20 USD. One of the most beautiful beaches on this island is Crane Beach on the south coast (often rated as one of the top beaches in the world). While the waters there are much wilder than on the west coast, my kids love jumping the waves and building sandcastles on this beautiful expanse of sand (we keep them very close to us due to the currents). Just up the road from this beach is the delicious deli Cutters, with great food and the best rum punch on the island (IMHO). If you call ahead, they can make you a picnic for the beach. The east coast beaches are beautiful, but wild – great to look at but no good for a family swim. Beach chair and umbrella rentals: All of the beaches listed above have chair and umbrella rentals. The day rate for 2 chairs and an umbrella is about $20-$25 USD. Important Update: In January 2018 it became apparent that Barbados was having a rather major sewage issue (allegedly due to a poorly maintained and aging system). We visited in March 2018 and all the west coast beaches were fine. Some of the south coast beaches (and businesses), however, were experiencing big problems including Rockley Beach, Worthing Beach and Dover Beach. Local residents have been doing a pretty good job updating this situation on TripAdvisor Barbados Forums so I encourage you to take a look. There will be an election in Barbados in May 2018 and this will surely be a very contentious issue. You can also read a little more about the situation in this article. Sargassum Seaweed: In recent years, large blooms of this unattractive (and often smelly) seaweed have washed up on many Caribbean beaches – most prominently on the east side of islands. Following a particularly bad bloom in 2015, the islands have become much better at removing the seaweed quickly before it starts to rot (and smell). The scientific community seems to agree on two things. 1. We can expect the seaweed to be an ongoing issue. 2. The likely cause is the warming of ocean waters due to climate change. I realize that all this “full disclosure” stuff about Barbados beaches makes things sound pretty awful, but let me please reiterate the fact that there are tons of beautiful beaches to enjoy on the island, especially along the west coast. Carved into the limestone that uniquely makes up the island of Barbados (the rest of the Caribbean islands are volcanic), Harrison’s Cave provides a unique look under the surface. 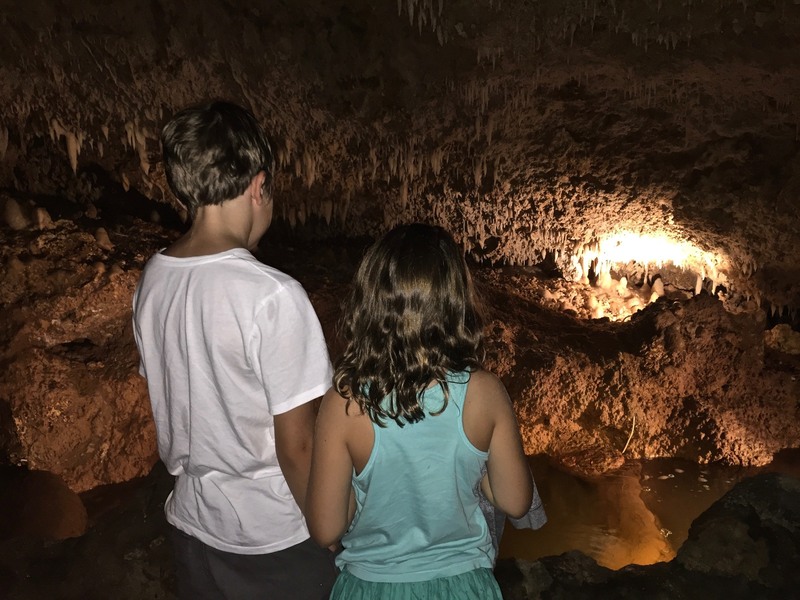 Via a 30 minute underground guided train trip, you get to see the crystalized limestone formations and stream system that carved out these incredible caverns. Learn more on the Harrison’s Cave website www.harrisonscave.com . Not far from Harrison’s Cave are the beautiful gardens of legendary horticulturist Anthony Hunte. His collection of tropical plants is quite astounding, not just for its variety, but also for its artistry. I will fully admit that I am not a gardener, but I took my mother (who sometimes travels specifically for gardens) and she declared it to be the most beautiful tropical garden that she has ever seen. Along with the kids, we very much enjoyed winding our way through the shady paths to a soundtrack of some lovely classical music. It should be noted, however, that the environment is rather quiet and serene. 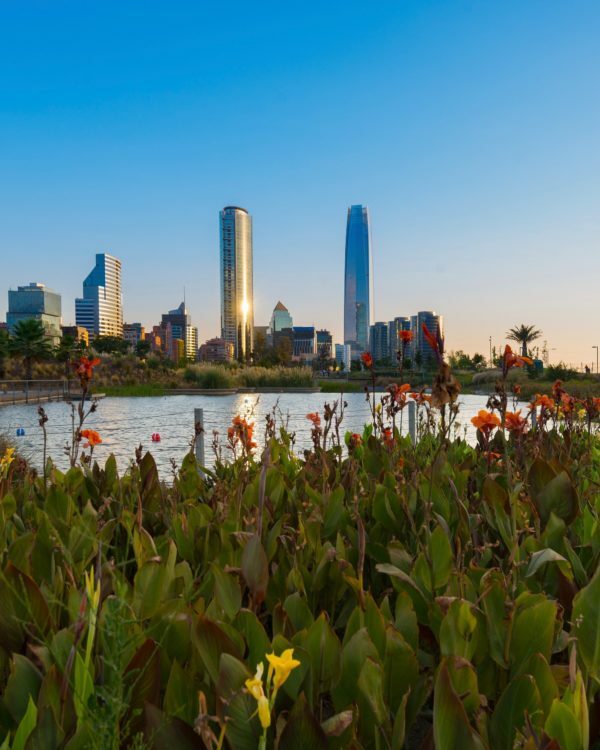 With young children, you may prefer the nearby Flower Forest. A visit to the gardens is not complete without having a piece of homemade cake and ginger lemonade on the veranda of Mr. Hunte’s house. It is here you will often have the opportunity to meet Mr. Hunte himself, who is an amusing and charming host. Learn more at: https://huntesgardensbarbados.com. 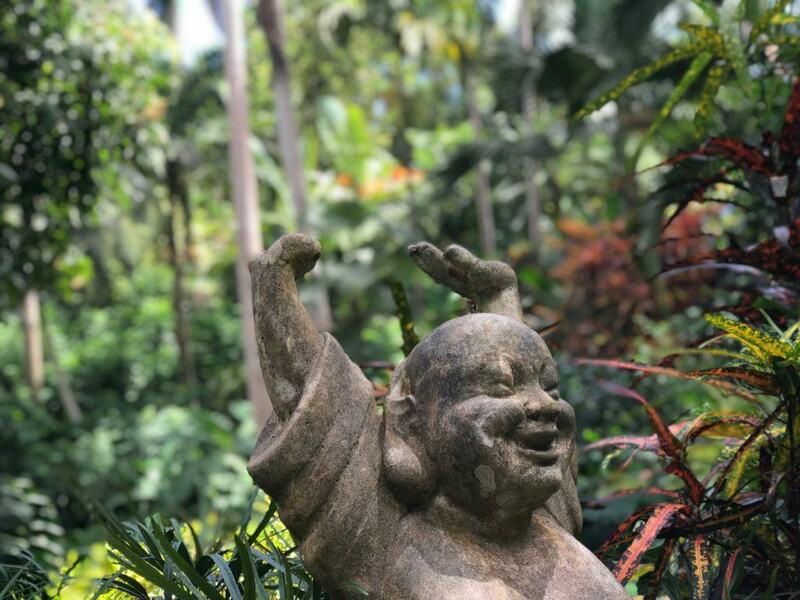 Note: Hunte’s Gardens are in close proximity to both Harrison’s Cave, Welchman Hall Gully (nature walk and monkeys) and the Flower Forest if you want to make a day trip out of your visit. If you have an early riser who is also a horse lover, there is a special experience just for them. In the wee morning hours (5:30am – 7am) trainers from the Garrison Savannah Race Track take horses down to Pebbles Beach just south of Bridgetown for a little water therapy. Grab a coffee at the nearby Radisson and sit yourself down in the sand to enjoy this beautiful sight. You are best to sit a ways back as these are race horses after all, and they can be rather spirited. Race days are also popular with families (although we missed this experience due to a rain cancellation). See the Garrison Savannah Race Day schedule here. Want to see more? Here is a short youtube video of the horses. Until we discovered Flytographer, we had very few decent family photos. Twice now in Barbados, however, we have booked a Flytographer photoshoot to capture some of our trip memories. The shoots have been short, easy and according to the kids “even fun”. Flytographer packages start at $250 USD for a 30 minute session. 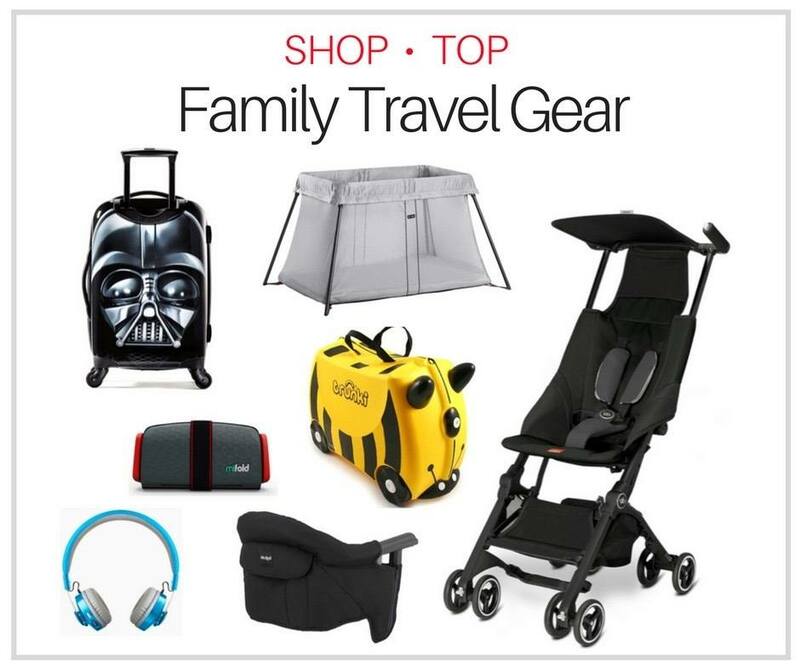 We opted for this starter package the first time and then bumped up to a $350, 60 minute package on a following trip as we had the grandparents with us too. 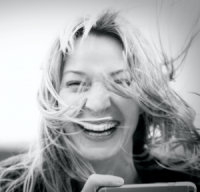 Interested in capturing your trip memories? Click the following link to get a $25 Flytographer discount on your first photoshoot. 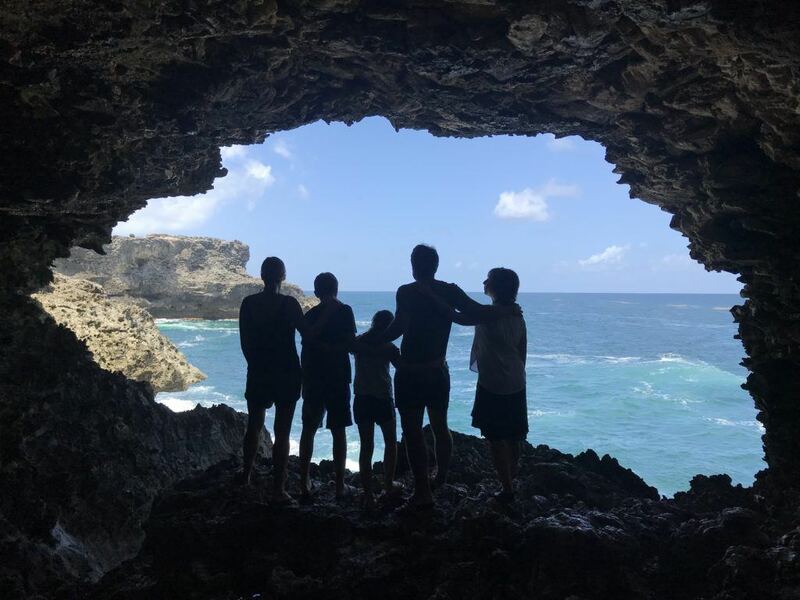 The Animal Flower Cave is located at the most northerly point of Barbados in the parish of St.Lucy. The name “Animal Flower Cave” comes from the sea anemones found in the pools of the cave, although at the time of our visit there were not many anemone to be be found. 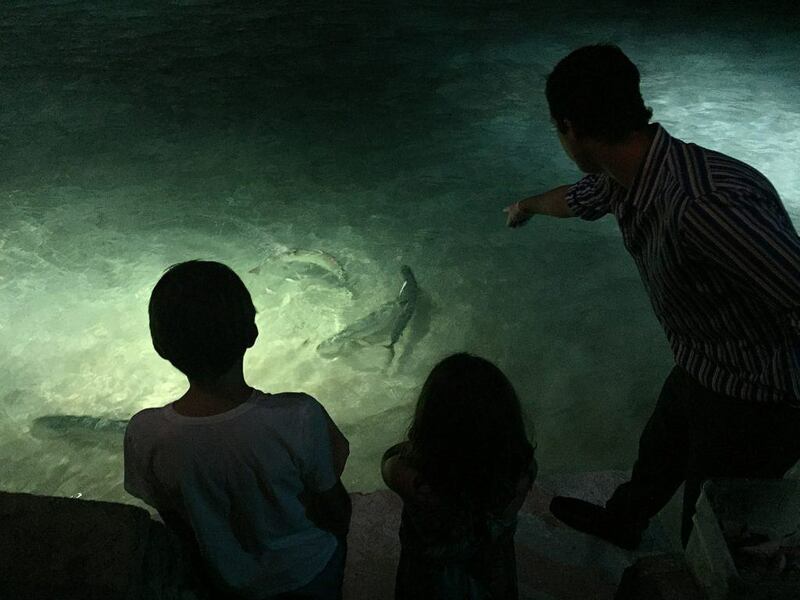 Still, the caves are beautiful to see and my kids loved having a dip in the pools (brings a suit and towel). All visitors must descend into the cave with a tour guide (tour is about 30 minutes long). As would be expected, the ground is very uneven in the cave so this particular tour is not great for anyone with mobility issues (My dad, recovering from achilles surgery enjoyed the view from the top). Learn more at: www.barbados.org. Although we did not eat at the caves, the restaurant gets good reviews. There are also a surprising number of little shops at this spot if you are looking for souvenirs. Local bathing suit and cover up designer Kelly Anne of Kelly’s Kloset has an outpost at this location as well as in Worthing (her pieces are lovely and quite well priced). On our most recent trip to Barbados, we decided to try to take in a local event in the form of a polo match. Polo season in Barbados runs from January to May, during which a number of international teams visit. The events take place at either Apes Hill or Holder’s Field and are a family-friendly affair (there is even a little playground set at Apes Hill). The cost of entry is $20 BDS ($10 USD) per adult (children 12 and under are free). There is food for purchase as well as a full-stocked bar (including bubbly of course). While the dress code is not super strict (no beach clothing), we very much enjoyed dressing up a little for it. 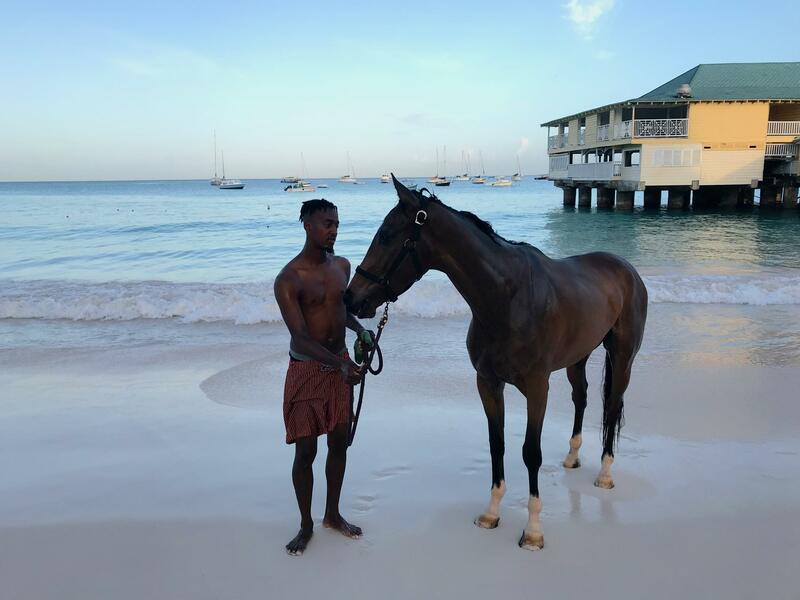 Get the schedule here: https://barbados.org/polo. Cricket is the national sport of Barbados and the West Indies. While we have yet to catch a match, they are hugely popular and are played at Kensington Oval on the outskirts of Bridgetown. Find out if there is a cricket match on Barbados during your stay right here: https://barbados.org. Naturally, this is not an exhaustive list of things to do on Barbados with kids. In fact, our most recent family trip to Barbados coincided with that of another family travel blogger. 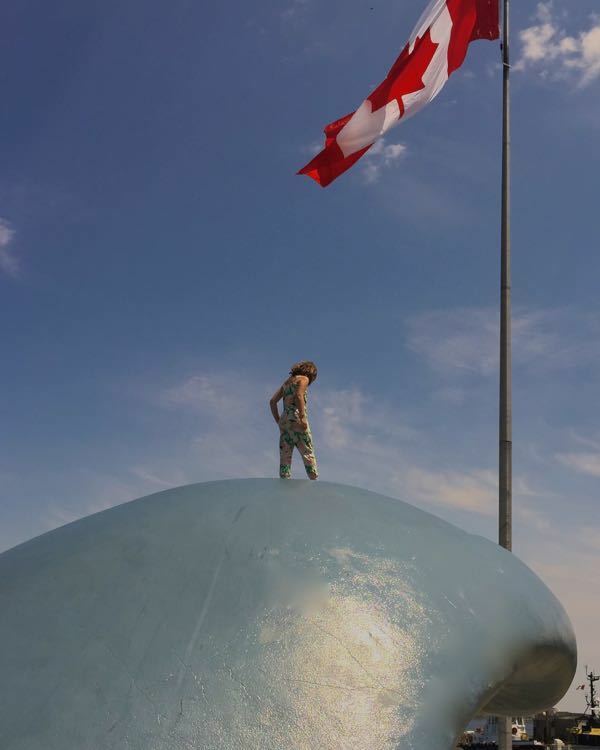 Andrea and her family visited a number of interesting places that we have not yet been to. 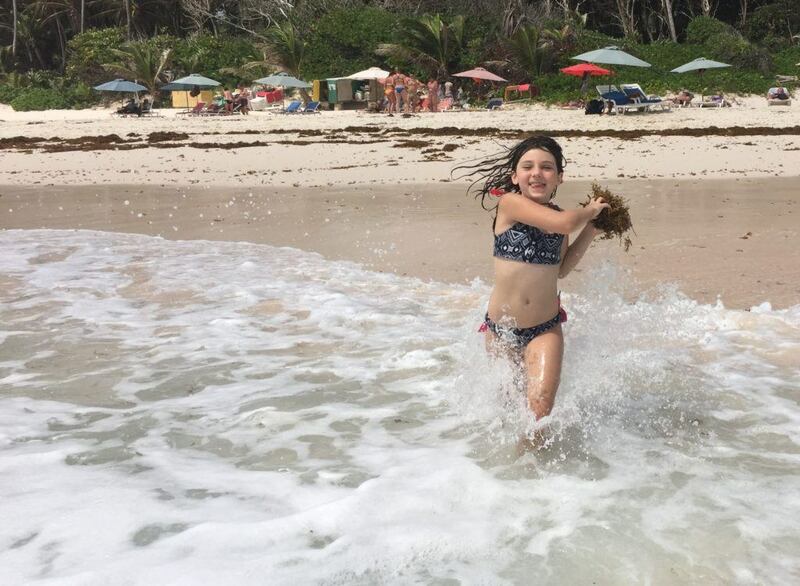 Check out her guide to a Barbados family vacation on her wonderful site The Family Backpack. All of the Barbados family hotels and resorts in this section are located on the west coast or “Platinum Coast” of Barbados. I like this area best for families as the beaches are the nicest and the calmest on the island. As noted earlier in this post, there have been some water quality issues in the south that need to get resolved before I am comfortable adding any properties to this list from that region. Reviews: 95% of family reviewers rate as very good or excellent on TripAdvisor. 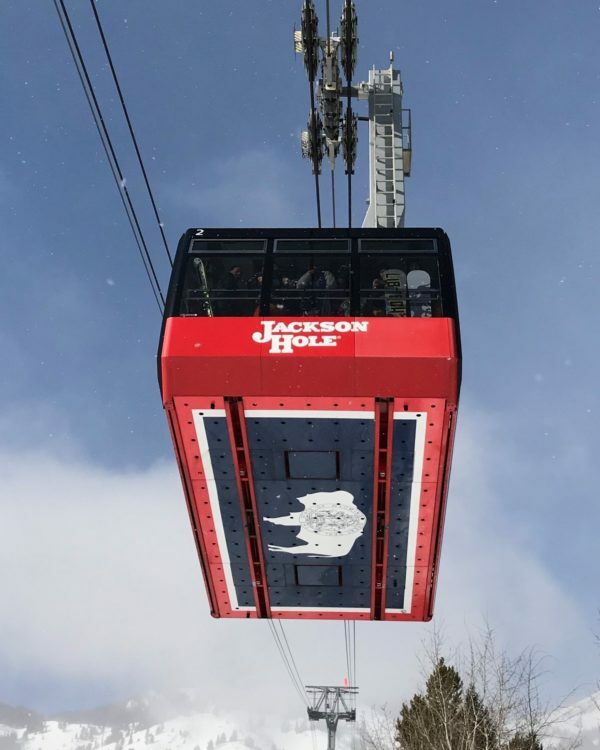 Family Friendly Features: Interconnecting suites and 2 bedroom suites, baby amenities, beach toys, babysitters for hire, season family promotions (kids eat free, 2nd room deals etc. ), and special children’s activities during the holidays (family excursions, crafts etc.). Reviews: 98% of family reviewers rate as very good or excellent on TripAdvisor. Family Friendly Features: All meals, snacks and drinks included, several spa treatments (for adults), family and adult pool, water sports (motorized and non-motorized), fitness classes, pool concierge and much more ! Room Tip: The duplex rooms are recommended for families with older children as they allow for more privacy. Family Friendly Features: Complimentary daily buffet breakfast, baby and toddler friendly amenities (cribs, tubs, bottle brushes, night lights etc. ), Flying Fish kids’ club (3-12 years), teen lounge, babysitting services (additional fee), games for loan, 3 pools (2 for families, one that is adults only), complimentary motorized and non-motorized beach toys and a water trampoline. Review: See our full review of the Tamarind here. Family Friendly Features: 1,2 and 3 bedroom suites fully equipped kitchens, baby cots, 2 pools, spa, babysitters for hire, excellent restaurant on site. Note: We stayed here on our first trip to Barbados with a toddler and a baby. We really enjoyed the spacious suites, although I would make sure you do not get one that is close to the road. We also found that the hotel was a little out of the way for our excursions (mostly to the beaches further south). That said, it is still a lovely place to stay and having all the extra room was nice. Reviews: 89% of family reviewers rate as very good or excellent on TripAdvisor. Family Friendly Features: All meals, snacks and drinks included, tiered lagoon-style pools, water sports, Flying Fish kids’ club (3-12 years), baby and toddler friendly amenities (cribs, tubs, bottle brushes, night lights etc. ), babysitting (for a fee), Aqua School, tennis lessons and more ! 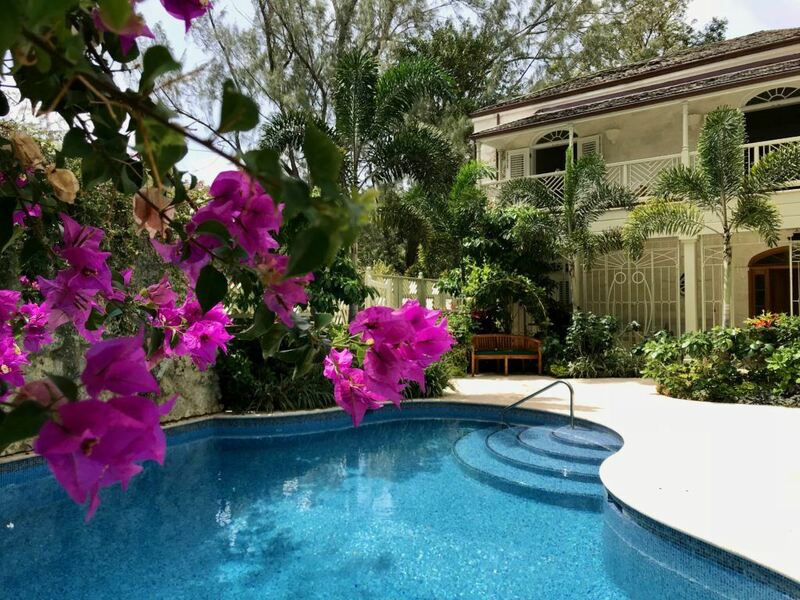 Alternatively, you can opt for a Barbados vacation rental (VRBO etc.) which can be more economical, especially if you are visiting with a group. For the best options, book way out, read reviews carefully and book for a minimum of 7 days (you can rent some for shorter periods, but the best ones seem to rent for a minimum of a week). If possible, I recommend staying on the west coast, where you will be close to the nicest beaches on the island. 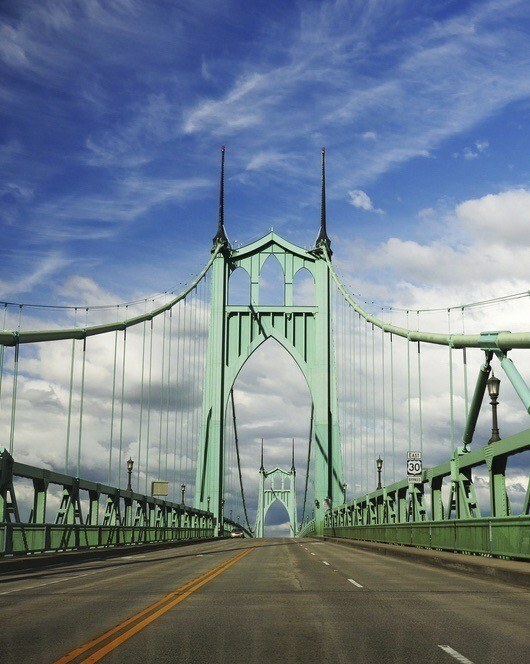 That said, there are many beautiful inland options too – often with gorgeous island and ocean views. Many Barbados villa rentals come with staff, which can include a cook, a housekeeper, an overnight security guard and for the really swanky ones, even a butler. When these services are not provided, you can always hire someone to come in as needed. As an example, we once hired a local woman to come in and make our family a traditional island dinner (which was enough food to last us for two meals). High season on Barbados runs mid-December through mid-April. Outside of that, you can find discounts upwards of 50% for the same property. Although we are now unfortunately slaves to the school calendar, we used to pull the kids out of school and visit the Caribbean in early December, when the weather is generally great (hurricane season officially ends Nov. 30th) and prices are low. Many villas will also allow rentals of less than a week during these slower times. On our most recent trip to Barbados, we were lucky enough to be staying at a gorgeous new 4 bedroom luxury villa on Mullins Bay called The Hemingway House. My parents decided “to spend it while they still can”, and we were fortunate enough to be invited to join them. This lovely property was perfect for our multi-generational trip – so perfect, in fact, that we found it hard to pry ourselves away to explore the island. If you would like to take a look, here is the listing on VRBO. See also this post on Luxury Beachfront Villas in Barbados. 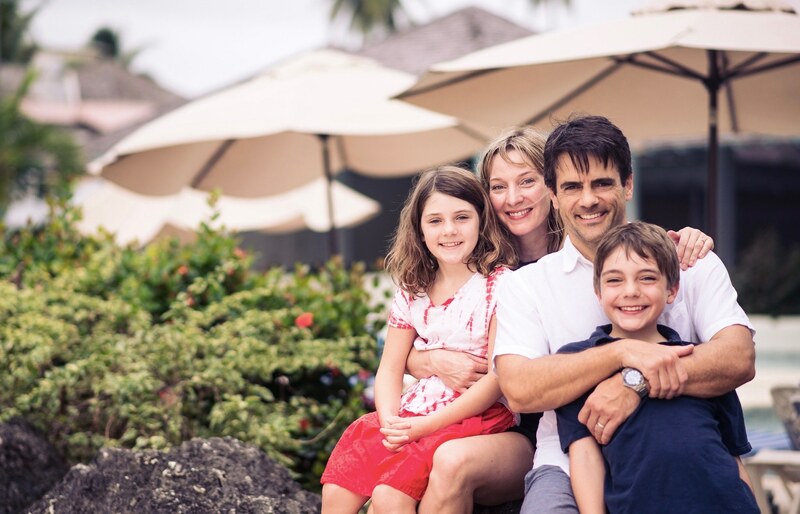 Barbados has no shortage of family-friendly restaurants (including many of the fine-dining establishments). 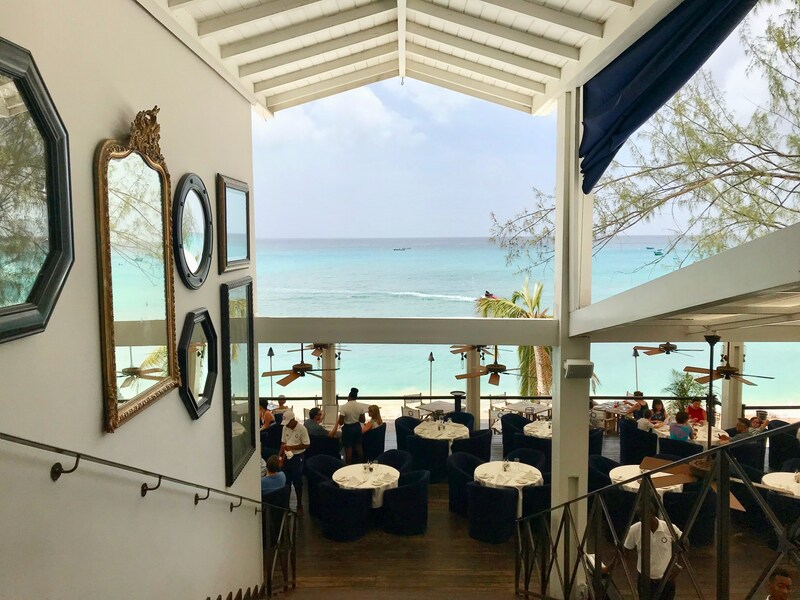 Personally, we are partial to beach-front establishments, where the kids can play in the sand rather than have to wait at the table if the meal runs long (Barbados restaurants sometimes run on Island Time). On Friday nights, a large number of islanders turns up for live music and fresh-off-the-docks flying fish at the Oistens Fish Fry. 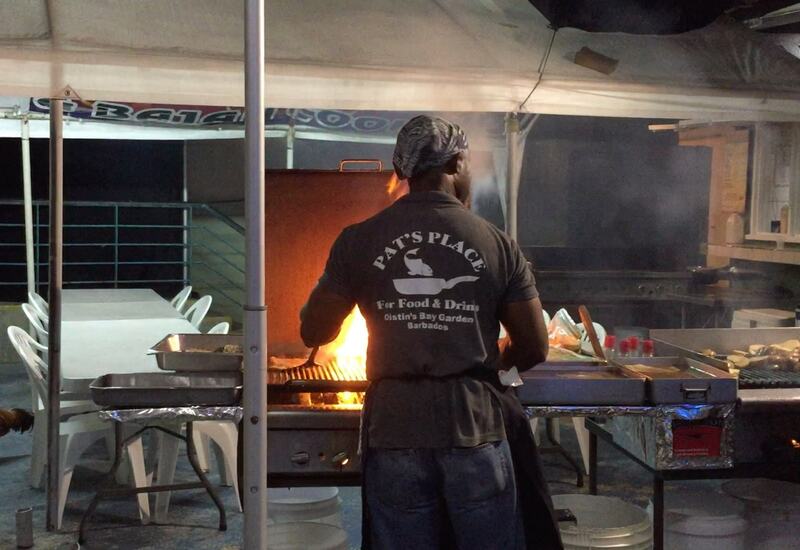 There are many restaurants to choose from, but we decided on Pat’s Place as it had been recommended to us by several locals (white tent – big crowds). Things start to get busy around 7pm, but with kids, you may want to go before sunset to feed the giant sea turtles that hang around the end of the jetty (you can buy some fish scraps from the adjacent fish market). You do not have to go to Oisten’s only on Friday nights, but that is when it is the most lively. We chose instead to go on a Saturday night, which turned out to be “Karaoke Night”. Although at times it was painful, I did get a kick out of hearing a Bajan couple singing Endless Love. See Barbados.org for the full Oistens Fish Fry schedule. This bar and restaurant serves up delicious fresh seafood and other Caribbean fare on a lovely sunset-facing deck. 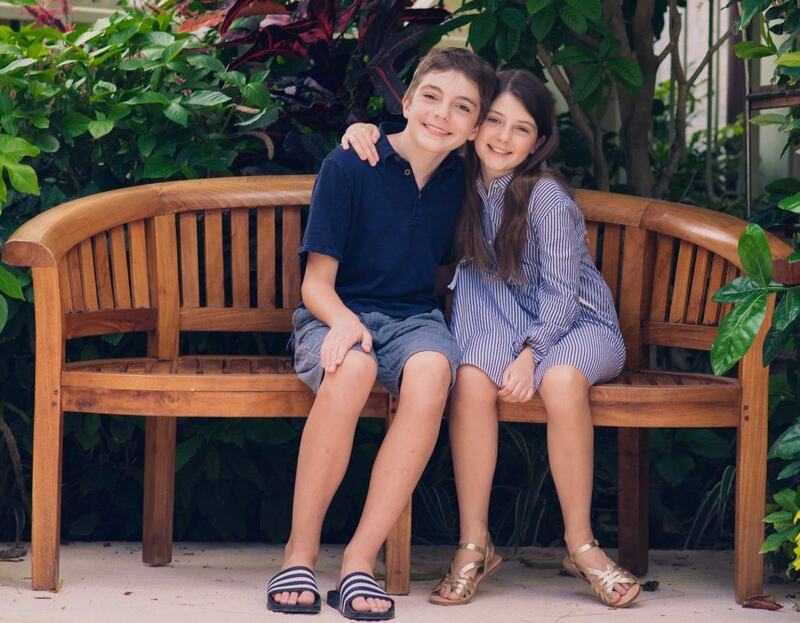 The coolest thing about this place is that you are perched right over the water, and at night, the lights from the restaurant attract giant tarpons and stingrays which managed to keep my kids very amused (the restaurant also has a kids’ menu). See reviews of the Cliff Beach Club here. 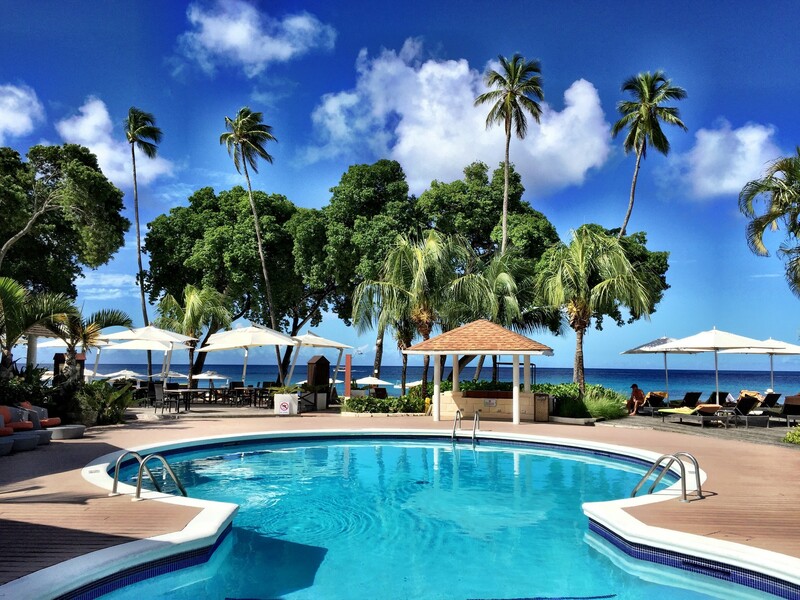 December to April is the nicest time to visit Barbados (dry season) but also the most expensive. In the past, we have also enjoyed visiting the Caribbean in late November or very early December (shoulder season), which is much cheaper, and just outside of hurricane season (June-November). 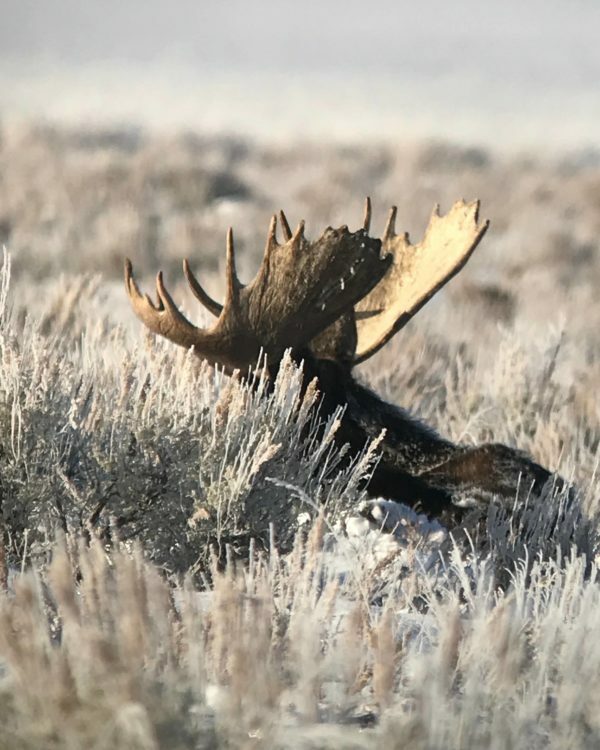 In about a dozen trips at this time of year, we have yet to experience any extended bad weather, and pay about half what you would in high season. To truly experience the best of Barbados, you should either rent a car or be prepared to spend a small fortune on taxis or tours. From my experience, renting a car anywhere in the Caribbean can be a hit and miss scenario. Having done a lot of research on this subject before our first trip to Barbados, however, we opted to rent from Stoutes despite the fact that it was more expensive than some of the other car hire options. 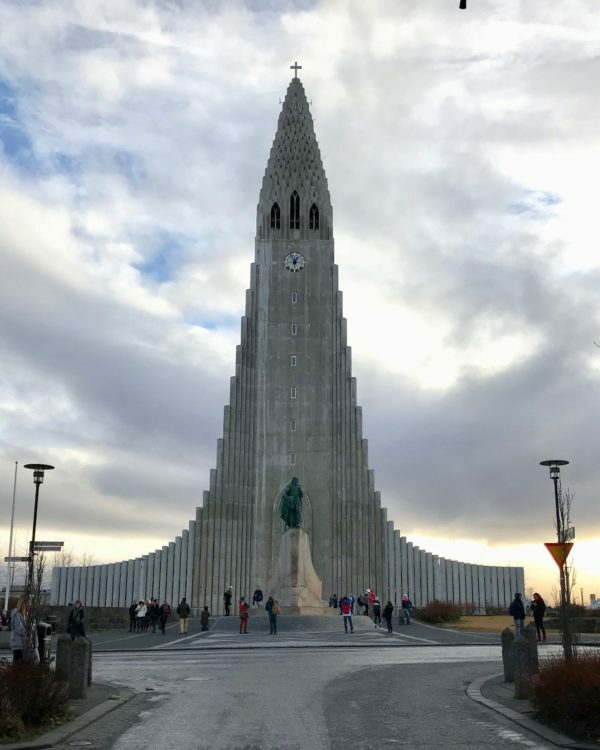 I am happy to report that everything went seamlessly, from the airport pickup to the drop off, and I would highly recommend them.They will also drop a car off at your hotel or vacation rental if you do not want a car rental for your whole stay. We rented from Drive-a-Matic on a more recent trip and it was a fairly good experience except for the fact that we couldn’t seem to get the built in GPS (not the ones they rent to you) off the island of Japan – clearly where the vehicle had been imported from. We chose Drive-a-Matic over Stoutes in this case because they had a vehicle that could accommodate 6 people plus luggage. Barbados also has a very robust bus system. The buses are inexpensive and go almost everywhere on the island. I will say that having been almost run off the road by a few of them while driving, they seem a little wild. This bumper sticker seems to say it all (Don’t hate the player, hate the game). 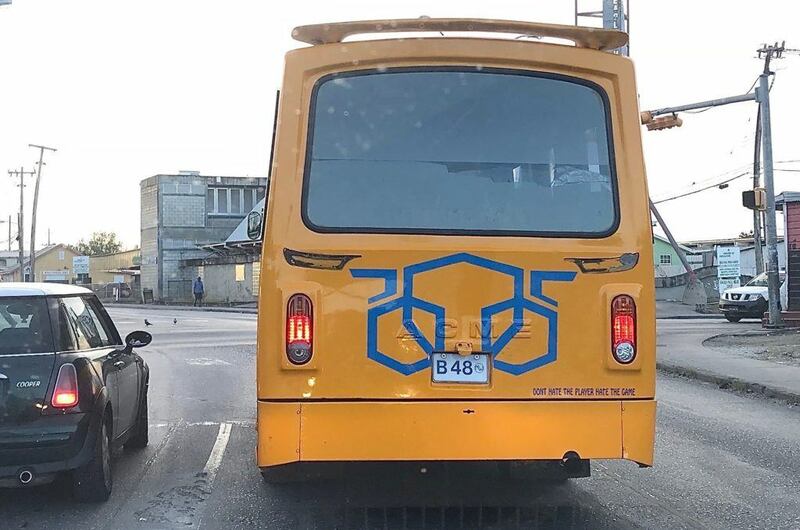 For more information on Barbados buses see: https://barbados.org. Is Barbados a safe place to travel? Like many islands in the Caribbean, you need to exercise caution by not wandering through towns or on the beaches late at night. Don’t flash around cash and be sure to use the safe in your room. Anything left on the beach is considered fair game. During our stays we have encountered nothing but warm and helpful islanders proud to share with us the beauty of their island home, but we do exercise caution. How do you get updated traveler information for Barbados? 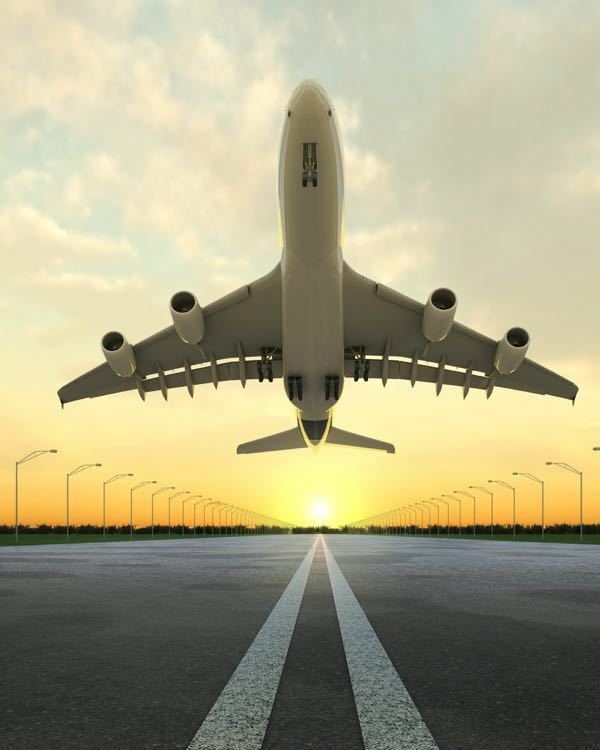 Check the travel advisories from the U.S. Department of State , Government of Canada, or the Gov.UK sites. Also worth looking at on these sites is the health section to see if there are any exceptional warnings (mosquito borne illnesses such as Dengue and Zika can be quite prevalent in tropical locales). My other go-to resource for health concerns is the CDC website (Center for Disease Control). The Zika virus IS present in Barbados. Pregnant women and women who are trying to get pregnant should not travel to destinations where Zika is present. 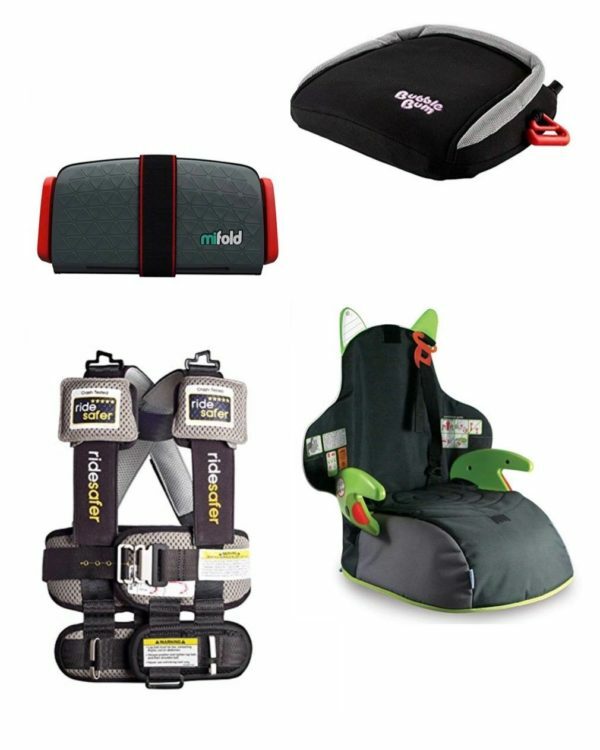 If you are looking to hire a babysitter or rent baby gear in Barbados, try Baby Gear Hire Barbados or Island Sitters. We have a rule in our family that any souvenirs purchased must be local. We bought hand tied bracelets and delicious rum cakes from Chattel Village in Holetown and Bajan rum from Four Square Rum Factory near Crane Beach (they have a nice kids playground ). Barbados also has a booming Duty Free business. Hi – great blog page! 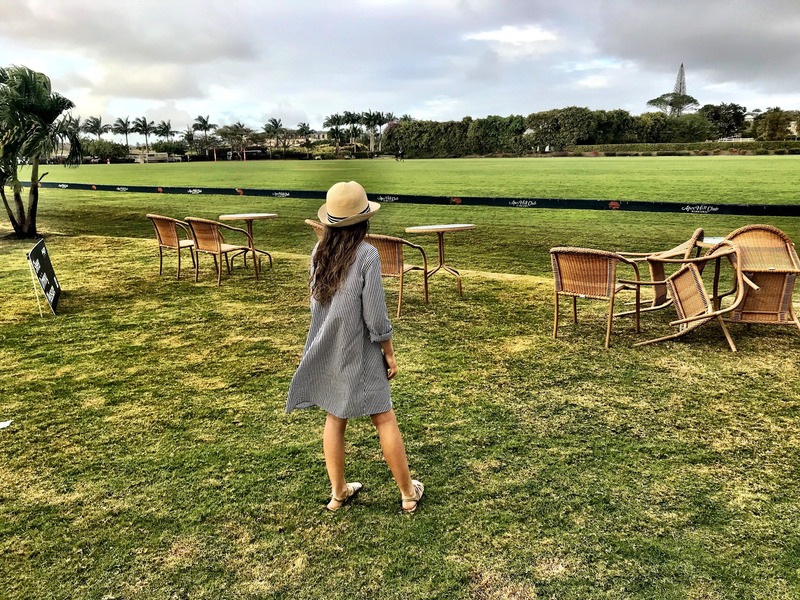 We’ve visited Barbados a lot over the last decade and now with two children in tow we find ourselves needing to find new things to do to keep them entertained. Our 2.5 year old loves to play in the pool which makes mornings easy but in the afternoon it would be nice to be able to find a nice park for him to run around in. Have you come across any nice ones on your travels? I know we can use the ones in Chefette but have found that he’s still a little bit too small to enjoy these. I must say that I would not bother going to Hunte’s Gardens with kids. My 3 were bored stiff! It wa quite expensive to get in and we were in and out in under an hour. The Flower Forest was a much better option with a lovely and interesting walk and the large cafe had enough space for the kiddos to run around in without annoying anybody. I’m so sorry that Hunte’s Gardens were a disappointment and I appreciate you sharing the fact that you found the Flower Forest to be much better. 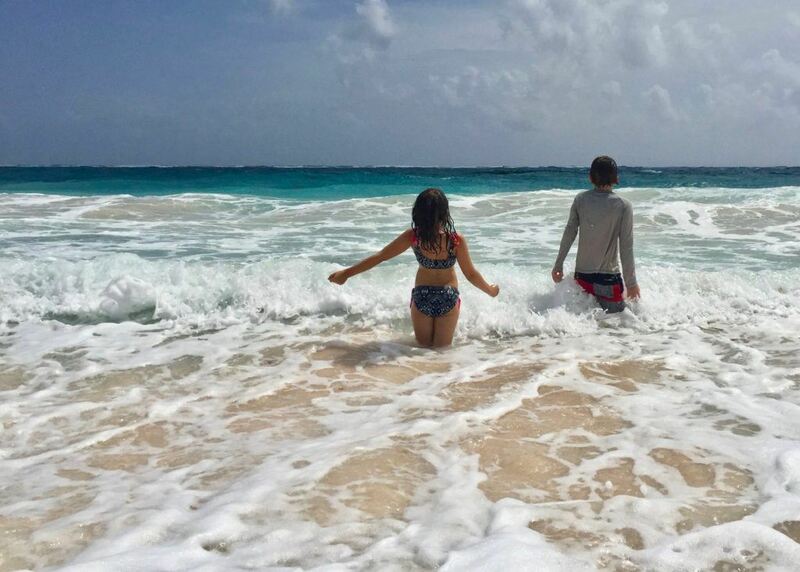 Did you have a favorite place to visit with your kids on Barbados? I would love to hear. Just wondering how bad the mosquito situation is in Barbados? We are planning on expanding our family but have booked Barbados for Christmas. I am told if we are staying in a popular area on the beach it shouldn’t be too bad. Of course, we wouldn’t go if we were to become pregnant but we were planning on trying shortly after. Hi! How nice that you are considering Barbados. We love that island. Many villas and hotels on Barbados spray on a routine basis to reduce the mosquito populations. On our most recent trip, we rented a villa along the west coast (on the ocean), and the program was fed through the garden watering system. I would like to believe that it was something very safe and eco-friendly, but honestly, I do not know. The mosquitos were not bad, but that was probably the reason. On another trip we rented a villa off the beach in a garden filled yard. The mosquitos were quite bad making us not want to sit outside at all at dusk. I would recommend that you try to search the hotel/property on TripAdvisor, filter for month and do a search for the word “mosquito”. That might give you some more information. You could also email the property to find out whether they have a mosquito reduction program. We have visited about 15 different islands in the Caribbean over the years, and quite honestly, they all have had some mosquitos. I long ago gave up the natural repellents because I have yet to find one that works as well as the synthetics. We buy these individually packages wipes called Natrapel that use Picaridin rather than DEET. I like them a lot as they are easy to carry along in a bag if you need them. When the kids were babies, we also covered their cribs with mosquito nets (bringing those along with us if the resort didn’t have). While this may seem like overkill, a friend of mine contracted Dengue on St. Barths while pregnant with twins (they are all fine), and since then I just don’t mess around. I love this! But you have way too many ads on this page to really feel like I am understanding what is being said. I have to take a double look to see if it’s an ad or something related to the article. Hi Joyce! I’m sorry about all the ads. I just added a new program to try to automate them and clearly it is serving up way too many. I haven’t had a chance to adjust the setting because, ironically, I am on my way to Barbados. Is there anything I can help you with specifically?